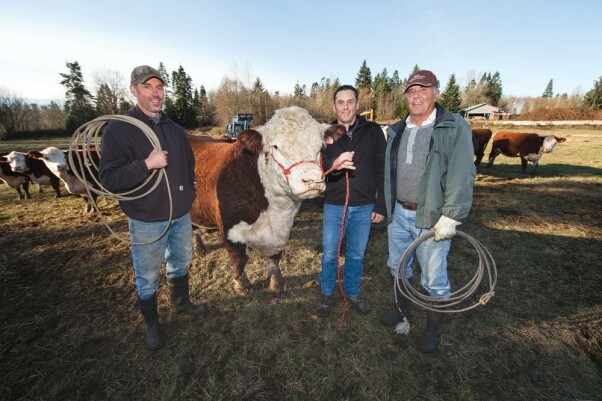 Courtenay Herefords finds their own path in an ever-evolving cattle industry. and is one of the things that makes this such a great place to live, recipe ” says owner Jody Williams, in her Fifth Street shop. Over the years there has evolved a plethora of so-called ‘Big Box’ stores in our community, and this is a merchandising reality that is showing no signs of abating. And, understandably, the Costcos and Wal-Marts draw a great number of customers; especially in tight economic times such as ours today. At the same time, however, there are those merchants that are more closely aligned with the local community, offering goods and services that can keep us in touch with what and who we are here in the Comox Valley. And as Christmas approaches it is well to bear in mind the uniqueness of that which can be found by ‘shopping in all of our towns—Courtenay, Comox and Cumberland. Such was the inspiration behind the Downtown Courtenay Business Improvement Association’s creation Winterfest 2012. It all began on November 16 with a Moonlight and Magic spectacle and will be continuing every weekend right through to Christmas Eve. 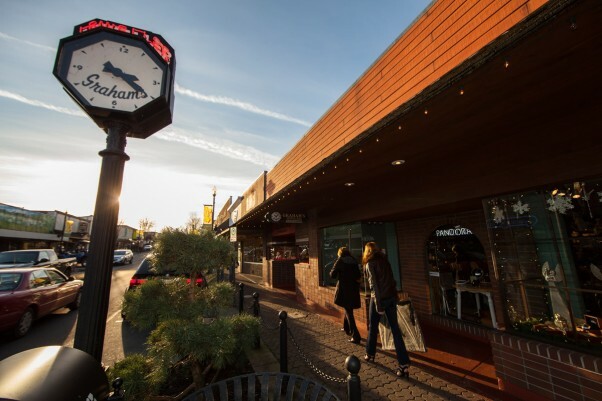 It’s designed to be a showcase of all that Courtenay’s downtown has to offer in the realms of goods, services, entertainment and fun for the entire family. There was a time when the merchants of Downtown Courtenay presented all the best of one of the unique smaller cities on Vancouver Island. The downtown core of Fifth and Cliffe area especially invited shoppers to an experience that was more than just the mere purveying of goods. They also offered service and relationships with their customers both longtime and new. The point being—and sometimes contemporary shoppers are losing sight of that—they still do. And the point of Winterfest is to remind the public of that reality. The allure is still there, as are unique goods and services that can’t be found elsewhere. And that is exactly what happened with the opening night of Winterfest. Much of the point behind the venture of arts, entertainment, festivity and merchandising was a drive by the DCBIA to lure people back to a downtown core that is admittedly in need of a big boost. Winterfest, with the full support and involvement of BIA members, is providing the lubricant to bring the public to the core of the city. She notes that she decided to focus on the six weekends rather than continuing through each week mainly to keep the energy levels high. “Picking a theme for each weekend (and you can follow what is taking place each weekend on Facebook) was a good way to promote the diversity of products and services downtown,” Cursons says. The Graham’s Jewellers clock is a fixture on Fifth Street. “I firmly believe that if you shop locally at an established business everybody wins in the long run,” says Graham’s Jewellers owner Jamie Graham. And it’s far from being over yet. Cursons is pleased with the way it has all come off. Others feel the same way about bringing the community to life and Courtenay merchants are first and foremost in extolling the virtues of their community. After 42 years in the same Fifth Streer location there is no question that Graham’s Jewellers has built up both a strong reputation due to the quality of its merchandise and the service it offers, but also due to its relationship with its countless customers. Graham concedes that sometimes better prices might be found elsewhere, albeit rarely, but is the shopper getting the quality he or she seeks? “We’ve seen many times how people have bought an item elsewhere, but then they come to us to get it sized or fitted, so it kind of defeats their purpose,” he says. More importantly, however—and he believes this is the message that must go out—is that people don’t always realize how much their trade matters to the local economy, the economy of the community in which they live. Vashti Lehrle and Nena Bill, co-owners of Secret Drawers Lingerie on Fifth St. believe that the most important facet of utilizing local merchants lies in the relationships that are established – relationships that last many years, Vashti says. Also, adds Bill, with that personalized connection you also get personalized service. Added to which, Secret Drawers offers a high-end quality product and specialized fitting services of the sort not to be found in the larger venues. And as Secret Drawers also offers a quality product that may indeed cost a little more, Lehrle says the advantage is that in a ‘throwaway’ society it is a simple fact that quality lasts much longer and often proves to be less expensive in the long run. 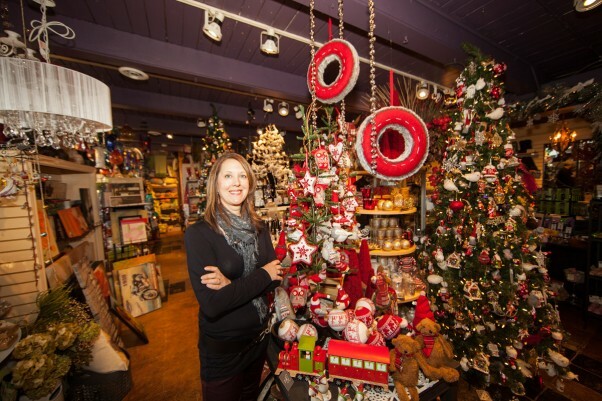 Jody Williams is the owner of Home and Garden Gate on Fifth Street in Downtown Courtenay and also a further shop in Cumberland, at 2720 Dunsmuir. The Courtenay store has been a downtown fixture for 20 years now, and the Cumberland outlet has been around for seven. The Comox Valley Chamber of Commerce is vitally interested in the promotion of a vibrant downtown Courtenay. Chamber President and CEO Dianne Hawkins is unstinting in her praise for the impact of Winterfest and the active involvement of the downtown merchants in the grand opening event in November. As far as shopping locally is concerned, Hawkins, by the very nature of the Chamber mandate, could not emphasize the value of this more. Terri Perrin, who handles marketing and communications at the Chamber, emphasizes that shopping locally should also mean looking into the sources of our products and services. In terms of shopping locally, however, there is a certain caveat that must be entertained and reckoned with. A local business might not be just a tried-and-true Comox Valley generated business. Muddying the water a little bit is the franchise operation. As for the downtown and its challenges, Hawkins observes this is not a problem unique to Courtenay—you find it across North America these days. But wait, there’s more. The 12-Days of Christmas is a traditional seasonal offering and the Chamber is going to be putting a Comox Valley spin on the ditty, says Perrin. She points out that each Chamber member business has been asked for a $50 contribution toward the project and notes that some businesses have generously contributed $50 for various non-profit members. The first verse, she says, revolves around the various locally-produced items that can be purchased, and the second focuses on charitable donations that can be made to assorted ventures that serve the public in need, such as the Salvation Army. “This is our Merry Christmas from the Chamber,” she says. More information can be found on the Chamber of Commerce Facebook page as well as at www.downtowncourtenay.com/winterfest. While Winterfest was designed as a Courtenay phenomenon it, needless to say, has had impact on the greater community, which will benefit from the local shopping enthusiasm spillover. We may not yet be one community in terms of governance but we certainly are a single de facto community. Consequently shopping invitations extend across a broad spectrum of options. Comox and Cumberland too are looking to the Christmas season and are reaching out to the public with both entertainment and marketing ventures. “All business associations are working together in the Comox Valley to encourage the public to support local businesses in their own communities as well as in the greater community,” says Kathy Penner, executive director of the Comox BIA. While the major seasonal events in Comox took place the first weekend in December, the allure of shopping in the town will continue to attract customers right up until the day as merchants rally to accommodate the public. The other event leading up to Christmas in Comox was their ‘Win a Trip to Vegas’ contest. “This is a campaign to encourage more visitation to downtown Comox during the Christmas season,” says Penner, noting that 16 Comox businesses participated in this draw competition and participation and enthusiasm was excellent. Some of the impact of shopping locally can be found in the site of the 10 Percent Shift, and it’s well-worth perusing, she says. The site can be accessed at www.tenpercentshift.ca. Meanwhile, back in her hometown of Cumberland, Meaghan Cursons notes that Cumberland does an “awesome” campaign called Christmas in the Village, which runs to December 14. The weekend of December 7 and 8 there is late night shopping with merchants showing off all the eclectic items to be found on the historic streets of the village, including handmade chocolates, arts and crafts, designer boots and garments and much more. “Cumberland’s downtown is such a great place to hang out and, of course, the music and arts scene is second to none,” Cursons says. And Cumberland does not forget those for whom Christmas isn’t always a time of great merriment. “On December 14 we have a big community fundraiser at the Waverly for local emergency shelters,” she says. Performing at the event will be Mary Murphy, Jilli Martini, Blaine Dunaway, Paisley Bandits, Brodie Dawson, Jack Roland and Archie Pateman, Annie Barker, Bobby Herron, Corwin Fox, Helen Austin, Pamela Tessman and Fiftieth Parallel. The 200-or-so white-faced cows grazing contentedly in the back pasture at 5364 Headquarters Road don’t know it, but they—along with the 320 acres they range on and the extended human family that both cares for them and profits from them—offer a fascinating portrait of a family farm in the context of the 21st century. These days, farmers are in the spotlight in new ways, some of which hold opportunity, others challenges. This is an era in which people’s interest in where their food comes from has never been higher, an era when the economic and regulatory hurdles facing small farmers are more daunting than ever, environmental and food safety concerns are ever-present, and the local is inevitably entwined with the global. For the 21st century farmer, a smartphone can be as important a tool as a pitchfork. 5364 Headquarters Road has been the home of Courtenay Herefords for 50 years. In many ways, what you find here epitomizes the traditional archetype of the family farm. 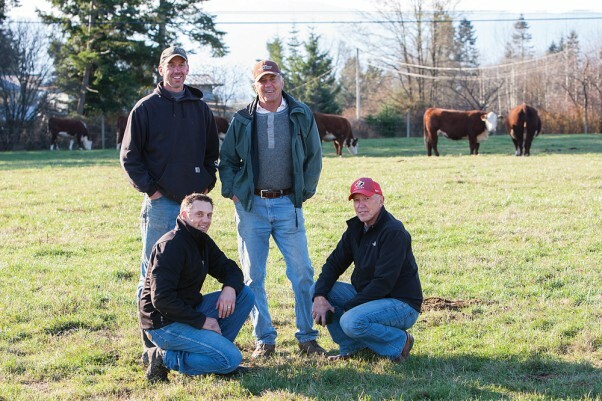 Three generations are involved, and looking back another two generations, the family was involved with starting the first creamery in the Comox Valley and was the first to import beef cattle to the area. As is the norm on small farms, the Lewis family does this as a labor of love, juggling farm work with off-farm jobs in order to make ends meet. To say they work hard is a gross understatement. Ask them why they do it and they say they love the lifestyle, love their fields and love their cows. From many angles, Courtenay Herefords presents a timeless picture of old fashioned farming. At the same time, it is very much a business, and for all its smallness and localness it is tied to provincial and national networks, and to international events—for instance, Courtenay Herefords currently ships cattle to Kazakhstan, a new market that emerged from the political remapping of the Eastern Bloc. As well, it has had to weather the disastrous impact to the beef industry of the 2003 BSE outbreak, and to develop the scientific expertise to remain competitive as a breeder of purebred cattle. It is this last ambition that lies at the heart of the Lewis family’s operation. They sell beef, but the farm’s main purpose is breeding cows for other farms, in particular supplying breeding bulls for commercial operations, which then supply the beef industry. They are one of the biggest—possibly the biggest—purebred Hereford breeding operation on Vancouver Island, but this doesn’t mean they can be, or would want to be, complacent. 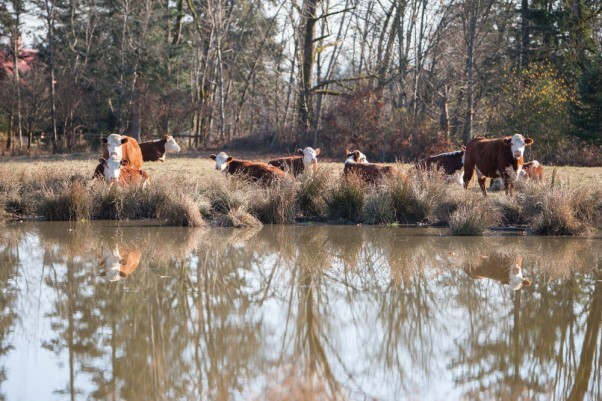 Courtenay Herefords is home to 200 purebred, grass-fed Hereford cattle, which range on 320 acres of local pasture. It is his first son, Johnny Lewis, who has the main responsibility for the breeding program, as well as for marketing and sales. “Back when my brother and I were kids, Dad basically said you’ve got two choices—the shovel or the pedigrees,” says Johnny, 46. “Well, I went for the pedigrees and that’s where I still am. My brother Robert went for the shovel and now he’s in charge of the equipment and the day-to day running of the farm with my dad; he’s out there now.” He waves his arm toward the window and the surrounding fields. Beef cattle are evaluated on a variety of qualities. General health and hardiness are of course a priority. Also essential is low birth weight to ensure easier calving. Another important quality is feed efficiency—basically, an input-output ratio that looks at how they turn food into pounds. The beef industry has ways to scientifically measure these sorts of things. “We want to know numbers-wise that our cows are competitive,” says John Sr. The evidence suggests that they most certainly are. “We send our bulls to the BC test station, and they’ve always been in the top 10 per cent of the province,” John Sr. says. Their cows regularly win prizes at local, national and even international Hereford shows. The key to Courtenay Hereford’s success in breeding, says Johnny, is the purity and uniqueness of their bloodlines. “We’ve stayed away from the mainstream. We are what is called an outcross to every pedigree,” he says, and then explains in lay person’s terms: “In cattle breeding, people tend to go for what does well in the shows. But what happens is all the cattle breeds are dictated by that. “For instance, there was this famous bull, Remital Keynote 20X, who was a big show winner. You can’t go anywhere and not find his pedigree in the cows. But that didn’t work for us. These were big show animals that ate a lot of grain. So we stayed away. Now people can come to our farm and buy something that is not directly related to any cows they have. But the best-bred cow in the world won’t do well on inferior food. This accounts for John Sr.’s other great ambition—to grow good grass, and to do so in an environmentally sound manner. “If we have a bad grass year, we don’t have a good cattle year,” says John Sr., noting that growing nutritious grass is an ongoing battle. The local climate, with its wet, cold winters and warm dry summers, means the land has to be supplemented with lime and manure on a constant basis. “The first thing we need to do is build the soil. We need to create the conditions for bacteria and worms. Otherwise the soil will peter out,” he says. “What we don’t want is a monoculture. Have a look at our fields—they aren’t all smooth and all one shade of green. There are weeds; there is variety. We’re growing a balanced ration with a lot of different cultivars, with legumes, even dandelions. “I’m proud of how we grow grass,” he adds. “We stay away from chemicals unless absolutely necessary.” The farm needs more cow manure than it produces, so the Lewises buy truckloads from local dairy farmers, compost it in a barn-sized manure heap that they turn with a backhoe, and spread the nutrient-rich result over the whole farm once a year. 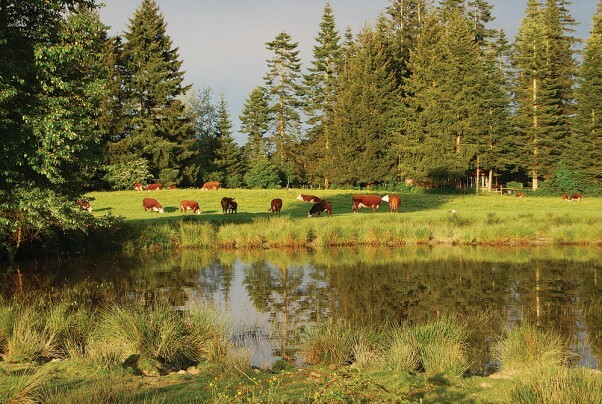 John Sr. has always been committed to farming environmentally, and in 2008, Courtenay Herefords became one of the first farms in the Valley to create an Environmental Farm Plan under the auspices of the BC Minister of Agriculture. The farm also entered into a 20-year agreement with the environmental organization Ducks Unlimited, aimed at protecting wildlife and wildlife habitat on the farm. As part of this agreement, Courtenay Herefords has agreed to maintain setbacks from rivers and creeks, to fence off sensitive areas, and to use natural rather than chemical inputs. These two programs helped Courtenay Herefords weather the challenging years after the 2003 outbreak of BSE, also known as Mad Cow Disease. The beef industry is getting back on its feet, say the Lewises, but prices still need to go up. This is where expansion into new markets, such as Kazakhstan, is making a huge difference. The Lewises started exporting their animals there last year and are expecting to continue this for three more years. This profitable connection is a reminder that although we like to talk about the relationship of the farmer to their land, other relationships are also crucial. “I’m out and about, talking to people,” Johnny says, somewhat modestly, describing what in fact is a demanding (and fun, he says) job of networking. As part of that, Johnny is a Director of the BC Hereford Association. “So I stay in the loop,” he explains. Through that role he got in touch with a big exporter, who was in touch with importers in Kazakhstan. “Now he calls me up when he wants cattle,” he says, adding that Kazakhstan represents a great opportunity. After the Soviet Union broke up, Kazakhstan needed to create a market economy. The country has grasslands the size of Montana and is near two huge markets—Russia and China. And there’s a growing market within Kazakhstan, Johnny explains. “In the past, wild horses were apparently the main source of protein. Now the economy is better and there’s oil money there, so you’ve got a growing middle class. So, the government is investing in building a beef industry. This seemingly unlikely client has provided a much-appreciated boost not just to Courtenay Herefords—Kazakhstan is importing cattle from all over the world in order to fulfill its goal of bringing in 72,000 head of cattle in the hopes of becoming a major beef exporter by 2020. This bovine jet-setting needs to be as safe and humane as possible. The cows first go to Manitoba for a month of quarantine, and then for the flight to Kazakhstan they are in well-padded wooden crates and are overseen by a veterinarian. National events and issues also influence the farm’s operations. The E. Coli scare this summer, when Alberta meat packer XL Foods released tainted beef into the market, is a case in point. Johnny gets frustrated when he hears people say that Canadian beef is unsafe. “Canadian beef is safe. Where the wheels fell off is in the packing plant—it’s so huge, like an assembly line, just like at a car factory. Those big plants have up to 4,500 head a day going through the production line. If there’s one nick to a bowel or bladder and that stuff gets out and contaminates a carcass, and it contaminates the equipment, it gets all over. And that beef is sent out all over the continent with that contamination,” he says. The silver lining of the XL Foods E. Coli outbreak is that it raised interest in local beef. Smaller can definitely mean safer, says Johnny. “On a farm like ours, you can come pick out your animal. It goes to Gunter’s Meats locally, where they maybe process half a dozen animals a day. Everything can be done at a slower pace; every step along the way can be monitored. The Lewis family is passionate about supporting—and practicing—local eating. “In the summer, our whole family can pretty much entirely eat food sourced within a one mile radius,” says Johnny, gesturing out the window with a big sweep of his arm. In a more rational and just world, suggests Johnny, farmers would be in the same income bracket as most other hard-working professionals. “You can have a million doctors and lawyers, and that’s great, but if there’s no food, we won’t survive,” he says. He’d like to see small farms make enough money so that the farmers don’t need to also hold down other jobs. Johnny works full time as an estimator for Nelson Roofing; his brother Robert works for Saputo and John Sr. is retired from BC Hydro after 27 years as an estimator. When called upon, John Sr.’s brother Richard, 68, also helps out. While not directly involved in the day-to-day farming operation, Richard, a partner in the land with his brother, operates a part-time sawmill on the property, and his welding and fabricating skills keep things running on the farm. “You’ve got to really want to do this,” says Johnny. “You’ve got to really love it. We’ve questioned it, for sure, especially as Dad is getting older.” But the questioning has, thus far, never led to a negative answer, and this farming family continues, enthusiastically and proudly, to function, to adapt, and to seek opportunity. John Sr.’s seven grandchildren are frequent fixtures around the farm and some are very involved in the youth farm group 4H, showing cattle with the Comox Valley Calf Club. The kids proudly show steers from their family farm, and Courtenay Herefords sponsors and helps out with the club—Johnny is one of the club’s leaders. In an era when it appears that young people aren’t choosing to farm, Courtenay Herefords seems to be bucking the trend. It may just be that, as they negotiate the challenges and opportunities facing a 21st century family farm, they are finding a viable path. For more information visit www.courtenayherefords.com or on Facebook at www.facebook.com/courtenayherefords.